image from page 3 of Sales Clipper, Vol. 21, No. 5, May 1963. 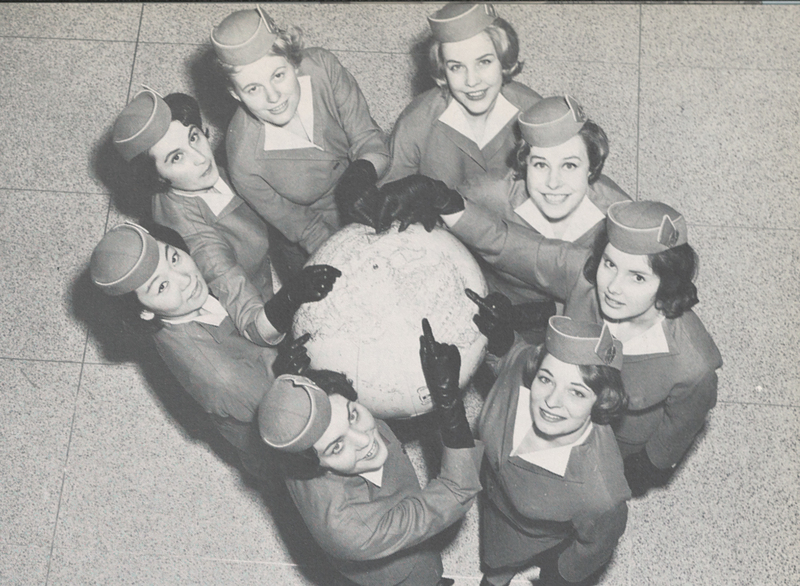 Caption reads: "Wide World: Eight new Overseas Division stewardesses gather round globe to point out their homelands. Starting at the bottom and moving clockwise, the girls are: Cecil Morin, Canada; Michiko Yanase, Japan; Kristina Prosowicz, Poland; Margit Gruschke, Germany; Bodil Classon, Sweden; Fleur Whitehurst, England; Elin Schmidt, Denmark; and Susan Leopold, United States." 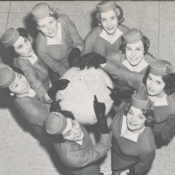 Pan American World Airways, Inc. , “Photograph of stewardesses from Pan Am's Overseas Division surrounding a globe pointing to their respective homelands,” UM Libraries Digital Exhibits, accessed April 22, 2019, http://scholar.library.miami.edu/digital/items/show/1805.